Mathematics is all around us. Often we do not realize it, though. 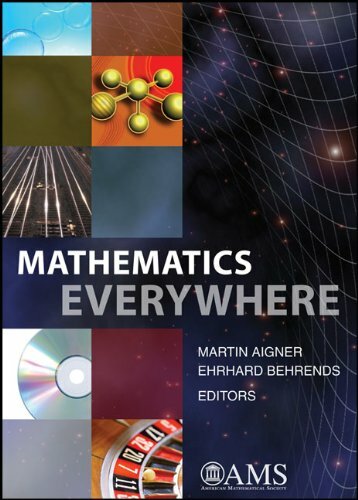 Mathematics Everywhere is a collection of presentations on the role of mathematics in everyday life, through science, technology, and culture. The common theme is the unique position of mathematics as the art of pure thought and at the same time as a universally applicable science. The authors are renowned mathematicians; their presentations cover a wide range of topics. From compact discs to the stock exchange, from computer tomography to traffic routing, from electronic money to climate change, they make the ""math inside"" understandable and enjoyable. An additional attractive feature is the leisurely treatment of some hot topics that have gained prominence in recent years, such as Fermat's Theorem, Kepler's packing problem, and the solution of the Poincare Conjecture. Or maybe you have heard about the Nash equilibrium (of ""A Beautiful Mind"" fame), or the strange future of quantum computers, and want to know what it is all about? Well, open the book and take an up-to-date trip into the fascinating world of the mathematics all around us. Table of Contents: Prologue: G. von Randow -- Math becomes a cult--description of a hope. Case studies: J. H. van Lint -- The mathematics of the compact disc; H.-O. Peitgen, C. Evertsz, B. Preim, D. Selle, T. Schindewolf, and W. Spindler -- Image processing and imaging for operation planning in liver surgery; R. Borndorfer, M. Grotschel, and A. Lobel -- The quickest path to the goal; B. Fiedler -- Romeo and Juliet, spontaneous pattern formation, and Turing's instability; S. Muller -- Mathematics and intelligent materials; P. Gritzmann -- Discrete tomography: from battleship to nanotechnology; J. Richter-Gebert -- Reflections on reflections. Current topics: W. Schachermayer -- The role of mathematics in the financial markets; A. Beutelspacher -- Electronic money: an impossibility or already a reality? ; M. Henk and G. M. Ziegler -- Spheres in the computer--the Kepler conjecture; E. Behrends -- How do quanta compute? The new world of the quantum computer; J. Kramer -- Fermat's Last Theorem--the solution of a 300-year-old problem; K. Sigmund -- A short history of the Nash equilibrium; R. Klein -- Mathematics in the climate of global change. The central theme: M. Aigner -- Prime numbers, secret codes and the boundaries of computability; E. Vogt -- The mathematics of knots; D. Ferus -- On soap bubbles; K. Ecker -- Heat diffusion, the structure of space and the Poincare Conjecture; E. Behrends -- Chance and mathematics: a late love. Epilogue: P. J. Davis -- The prospects for mathematics in a multi-media civilization.